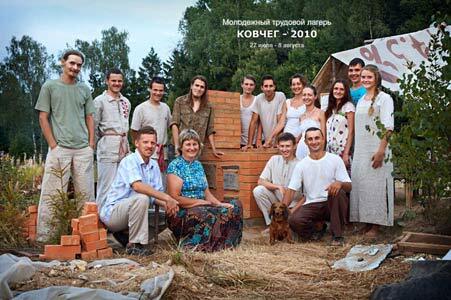 Photo gallery of the “Kovcheg”. Youth Labor Camp 2010. 10-th Summer young camp !!! Fedor is telling basic knowledge about bees - a life of bee-family in natural conditions, principles of natural beekeeping; demonstration of beehives. Lesson of beekeeping - centrifuge for extract honey from honeycombs, beeswax plate, other inventory and its competant use. Beeframe. The lesson is in new house for beekeeping. Somebody has seen a goat at first time (so near :). However, goat was nice and all liked it. On horizon Pasha is seen, filming video. Maybe a film will making. You can see steeps, special knifes and so on. It was telling refinements of work. It`s important to equal, in order to make easier put first row of bricks. Building of camp - Construction of oven - familiarization of not simple craftsmanship equal and accurate brickwork. Russia, 140 km SW from Moscow, Kaluga region. Living Ecovillage with ~120 permanent residents far from roads.